The MotionControl App for iOS & Android. Control Your Music. Sure, you love your music. But are you getting the most out of your tunes? 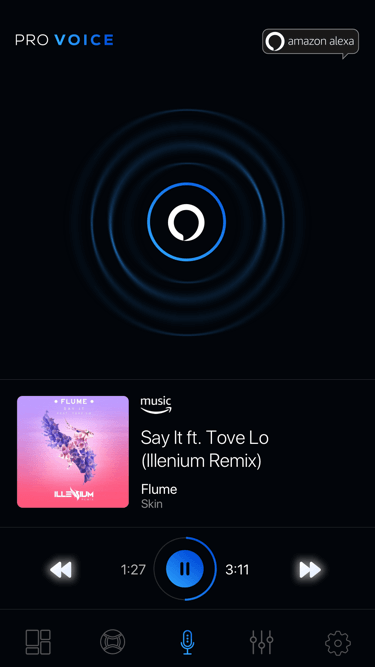 Enter MotionControl, our native app for iOS and Android, designed to give you more customization and unique control over the entire listening experience. Compatible with BTS Pro and PRO Voice, download MotionControl today to take your headphones to the next level. With MotionControl, you command the entire experience. 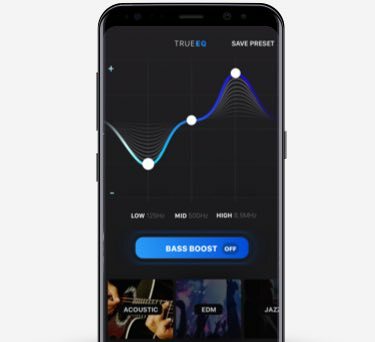 Adjust your music in real-time using our hardware-based TrueEQ™ multi-band equalizer. 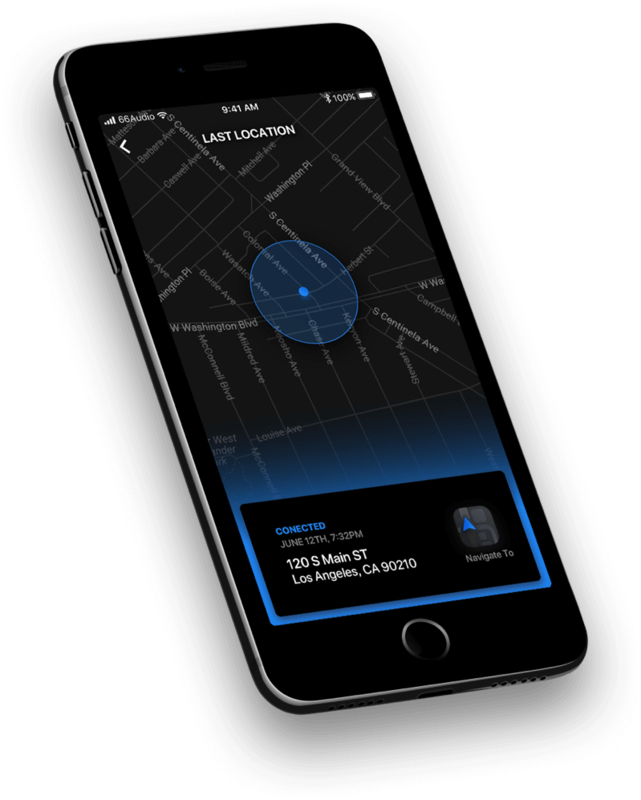 Last Locations ensures you never lose your headphones again. Not getting enough bass? 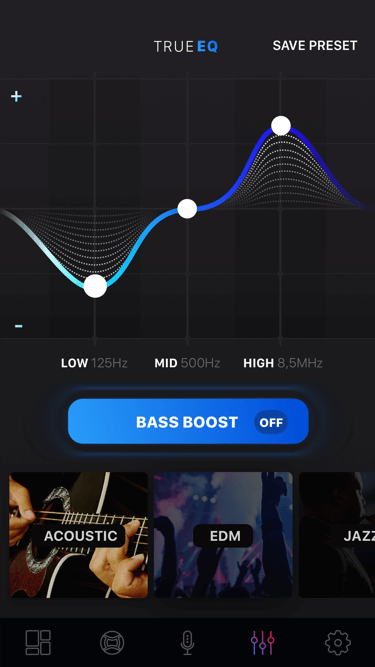 Bass Boost is here, just tap and listen. TrueEQ is no ordinary EQ. Adjustments are made in real-time as music plays directly on your headphones. Simply tap and slide the various band controls to set your exact sound. Next time you power on your BTS Pro or PRO Voice, your settings are retained in memory. It's that simple. Rock, hip-hop, EDM, country, jazz - you name it. 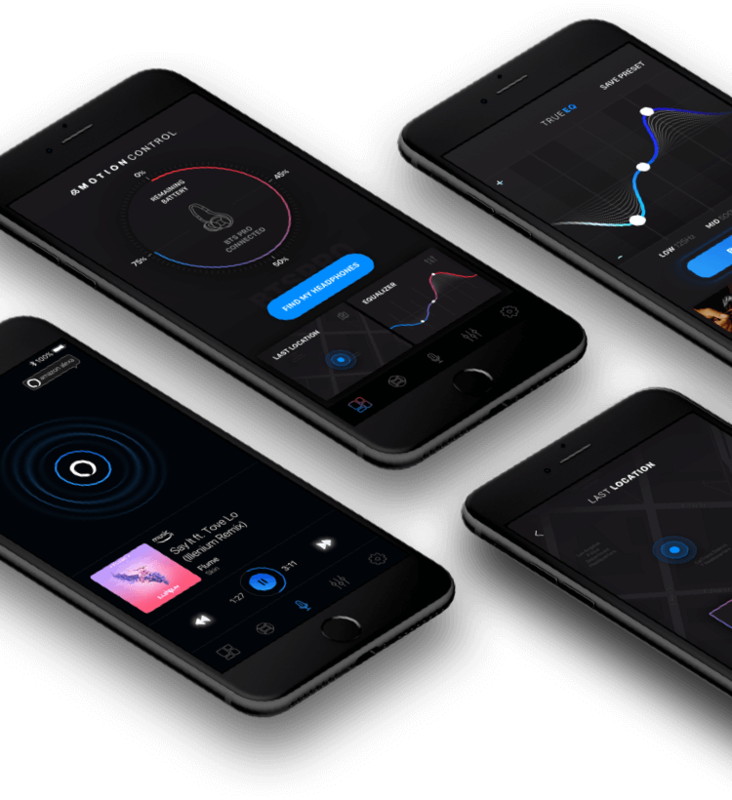 A handful of precisely tuned presets ensure you get the best sound reproduction with a single tap. Not good enough? Simply set and save your very own presets. The possibilities are endless. Sometimes we all need a little more bass. Our Patent Pending Bass Boost technology gives you that extra umph when you need it. More bass, no distortion, it's a quick tap away. Can't find your headphones? Don't sweat it. Launch MotionControl, tap Find My Headphones and we'll do the rest. With our Patent Pending beacon system, BTS Pro and PRO Voice will flash their LEDs and audibly alert you to their location. Life just got easier. Still can't find your headphones? This is why we designed Last Locations. MotionControl stores the last place you connected or disconnected your headphones. Using a combination of high-accuracy GPS, Wi-Fi and Bluetooth technology, locate your headphones within 10 feet of where you used them last. Now that's peace of mind. 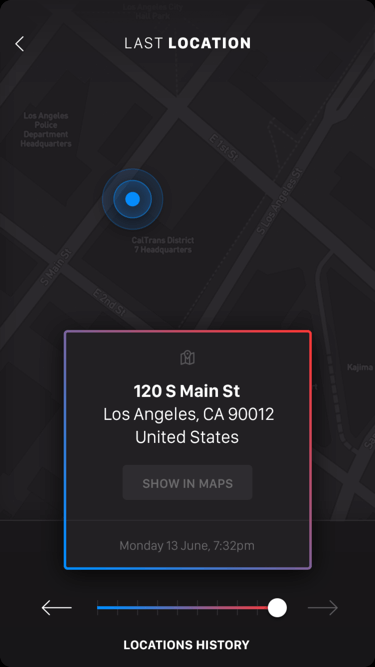 Your location data never leaves the app and is always stored locally on your device. GPS must be enabled to use Last Locations and accuracy may vary depending on the signal strength and number of GPS satellites available at time of connection / disconnection. 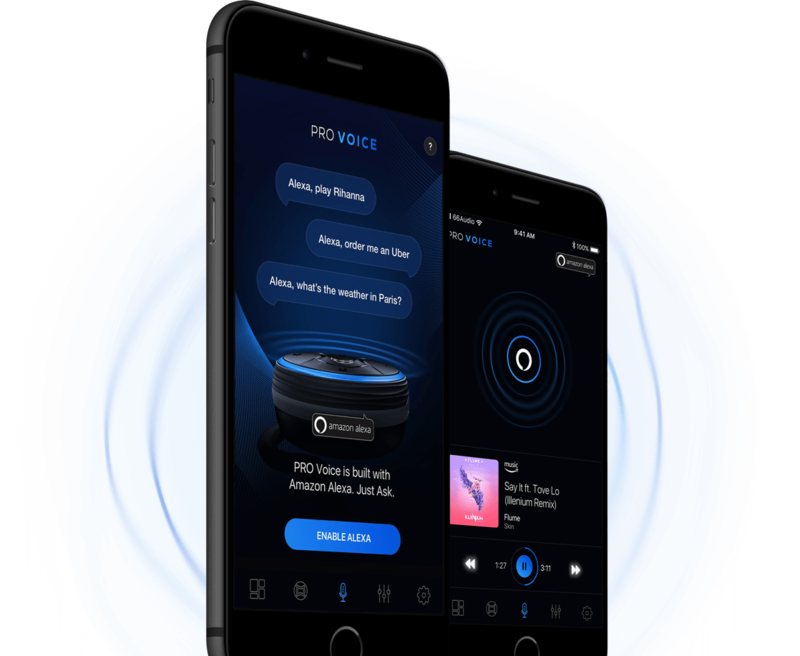 Using our ActiveVoice™ Recognition technology, we built Alexa directly into PRO Voice. Just Ask - even during music playback. Get the weather, play millions of songs from Prime Music Unlimited, control your smart home and so much more. PRO Voice is always getting smarter with Alexa. It's the future, available today. MotionControl has been optimized to work in tandem with the latest Apple Watch as well. No matter the device, MotionControl is ready to delivers an entirely new on-the-go wireless experience. 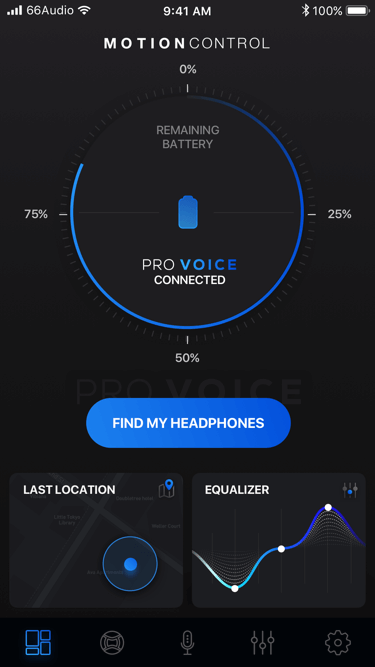 In the scaled-down version of the app, you can see your battery status in real time, trigger Find My Headphones or select a preset EQ for on-the-go personalization.